Denver, CO, December 31, 2015 -- TradeTech has introduced Mid-Term SWU Price Indicator1 the latest in the company’s Long-Term Price Indicator series first introduced on March 31, 1996, with the Long-Term U3O8 Price Indicator. “The uranium enrichment (SWU) market has evolved and much like the uranium market, enrichment sellers have begun exploring financing avenues and extending lower prices for delivery of SWU and/or enriched uranium product (EUP) within the mid-term delivery window in an effort to sell excess inventories. This factor, combined with uncommitted capacity from established and new market entrants, has created a multi-tier enrichment market with a clear separation between spot, mid-, and long-term delivery SWU prices,” said TradeTech President Treva E. Klingbiel. Furthermore, factors such as future production costs, delivery flexibility, political developments, government regulations, decommissioning and decontamination obligations, and the financial integrity of parties involved in transactions can complicate the price structure within the uranium enrichment market and affect price either directly or indirectly. Consequently, the price band for recent offers and contracts has been quite wide, and, as a result, the enrichment market has adapted, with both buyers and sellers accepting more highly differentiated pricing terms and conditions for mid-term or intermediate deliveries. TradeTech’s Mid-Term SWU Price Indicator, which will be published on the last day of each month, applies in cases where deliveries begin immediately beyond the 12-month spot delivery window and occur within three years from that point, as either standalone agreements or as part of long-term contracts. Editor’s Note: All of TradeTech’s Price Indicators are meant to relate to transactions in the mainstream of the world market, which are free from significant governmental restrictions or interference and, therefore, do not reflect conditions of non-arm’s length relationships, a participant’s desire to obtain or avoid specific origins, settlements of litigation, or other unusual situations or conditions. 1 The Mid-Term SWU Price Indicator is TradeTech's judgment of tof the base price at which transactions for mid-term or intermediate delivery of enrichment services could be concluded as of the last day of the month, for transactions in which the price at the time of delivery would be an escalation of the base price from a previous point in time. TradeTech, and its predecessor companies--NUEXCO Information Services, CONCORD Information Services, and CONCORD Trading Company--has supported the uranium and nuclear fuel cycle industry for more than 40 years, and is widely recognized for its expertise in trading activities and its comprehensive knowledge of the technical, economic, and political factors affecting this industry. TradeTech provides expert market consulting, participates in the buying and selling of uranium products and services, and maintains an extensive information database on these industries. The company publishes the Nuclear Market Review (NMR), which reports TradeTech’s Weekly U3O8 Spot Price Indicator, uranium trading activity, industry news, and market data. The monthly edition of the NMR, published on the last day of each month, includes TradeTech Market Values (Exchange Value, UF6 Value, Loan Rate, Conversion Value, SWU Value, and Transaction Value) and Mid- and Long-Term U3O8 Price Indicators, as well as price analysis, supply/demand data, and industry news. TradeTech also publishes The Nuclear Review, a monthly trade publication dedicated to the international nuclear power industry, and a quarterly Uranium Market Study, which provides timely analysis of the global uranium production industry, including spot- and long-term uranium price forecasts. Denver, CO, January 2, 2015 -- While TradeTech's Uranium Spot Price Indicator1 (Bloomberg: TDTC) climbed to a 26-month high of US$44.00 per pound uranium oxide (U3O8) in November, market activity declined and the spot price fell throughout December to end 2014 at $35.30—only $1.00 above the 2013 year-end price. “Following increased buying activity from all sectors and considerable market volatility in November, buying interest waned, especially among utilities, which accounted for less than 30 percent of the traded volume in December,” said TradeTech President Treva E. Klingbiel. “The majority of year-end demand was largely discretionary and utilities, as well as intermediaries and other buyers, are now looking to acquire material for delivery in the second quarter of 2015 and beyond,” Klingbiel added. Despite a more volatile spot market in the fourth quarter, annual spot market volume totaled just over 39 million pounds U3O8 equivalent in 2014, a marginal decline from 2013 volume of approximately 40 million pounds U3O8 equivalent. “Presently, spot uranium supply remains extremely thin as most sellers hold firm to offer prices and wait for increased demand during the first quarter of 2015, particularly in the mid- and long-term uranium markets, which, in turn, is expected to create some additional spot market demand as intermediaries look to secure supplies for mid-term opportunities,” Klingbiel added. The year 2015 is positioned as a pivotal year for the uranium market with Japan moving closer to the restart of its first nuclear power facility since the March 2011 Fukushima accident and new reactor build projects gaining momentum in Asia. In November, Japan’s Kyushu Electric Power Company received final approvals to restart the two reactors at its Sendai Nuclear Station, which are expected to return to commercial service in the first half of 2015, according to TradeTech’s latest forecast. 1 TradeTech’s U3O8 Spot Price Indicator reflects the company’s judgment of the price at which spot and near-term transactions for significant quantities of natural uranium concentrates could be concluded, based on data from recently completed and/or pending transactions, and firm bids to buy and firm offers to sell uranium concentrates on the spot uranium market. Denver, CO, December 20, 2014 -- As TradeTech releases Issue 4 of its Uranium Market Study 2014, the industry consultant’s Weekly U3O81 Spot Price Indicator (Bloomberg: TDTC) recently climbed to the highest level of the year. However, the year-to-date average price remains the lowest since 2005, as the nuclear fuel industry draws down excess supplies that accumulated after the global financial crisis and the Fukushima accident in Japan2. In the latest quarterly issue of the Uranium Market Study, TradeTech continues its evaluation of market dynamics and identifies root causes of current trends, while incorporating the underlying fundamentals into the latest long-term uranium supply and demand analysis. The report also includes spot and long-term uranium price forecasts through 2030. “As utilities enter the market looking for stable and diversified long-term uranium deliveries, they are currently met with limited options. Moreover, suppliers are seeking to cover full costs and provide a sustainable return. In recent weeks this has led to upward pressure on TradeTech’s Long-Term U3O8 Price Indicator, which in turn, has provided competitive leeway for near-term prices to rise,” states TradeTech President Treva E. Klingbiel. In Issue 4, TradeTech also evaluates sources of long-term uranium demand and uranium mining projects that are best positioned to meet future supply needs, as well as those that may be affected by current market conditions. Central to this evaluation is the report’s feature analysis of “SWU3 for U: Uranium Demand Flexibility through Underfeeding,” which highlights the operating fundamentals and advantages of enrichment underfeeding4, as well as effects the practice has on revenue streams for uranium enrichment companies. TradeTech’s Uranium Market Study Issue 4 also provides in-depth reviews of pivotal uranium projects, selected junior exploration and mining companies, and project financing, as well as secondary uranium supplies, supply/demand data, and supplier and utility profiles. For further information or to purchase TradeTech’s Uranium Market Study, visit: http://www.uranium.info/uranium_market.php. 2 TradeTech’s 2014 year-to-date average Weekly U3O8 Spot Price Indicator is US$33.14; in 2005, the average U3O8 Spot Price Indicator was $28.07. 3 SWU, or Separative Work Unit, is a complex unit that is a function of the amount of uranium processed and the degree to which it is enriched, i.e., the extent of increase in the concentration of the U-235 isotope relative to the remainder. 4 Enrichment underfeeding is the process by which a uranium enrichment company can substitute the amount of uranium used in the process by utilizing more SWU capacity. Denver, CO, November 11, 2014 -- TradeTech’s Uranium Spot Price Indicator (Bloomberg: TDTC) has climbed nearly 16 percent over the past week to US$42.25 per pound U3O8--the highest value since March 31, 2013, as buying interest from utilities, traders, and financial entities has fueled a steady increase in the spot market price. Increased buying interest has led sellers to progressively increase offer prices as each new sales opportunity emerges. TradeTech’s Weekly U3O8 Spot Price1 was $42.00 per pound on November 7, which in percentage terms was the second-largest increase (week-on-week) since 1996 (see chart). 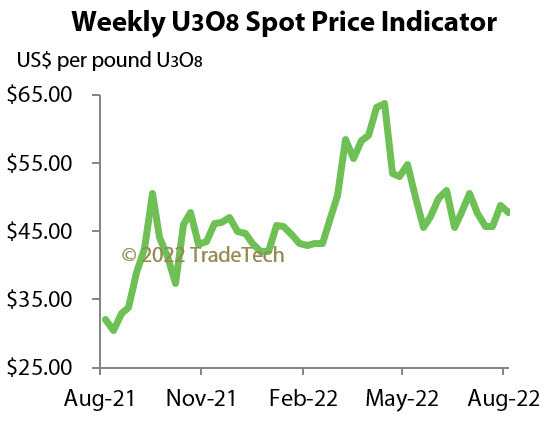 The spot price has continued its climb, with TradeTech’s Daily U3O8 Spot Price Indicator1 reaching $42.25 per pound on November 10. “Significant week-on-week price changes in the uranium spot market are relatively infrequent and this price jump was spurred by increased buying interest from all market sectors,” said TradeTech President Treva E. Klingbiel. “Although buying interest from financial entities and utilities is expected to increase before year end, the majority of current spot market demand remains largely discretionary,” she added. 1 TradeTech’s Weekly and Daily U3O8 Spot Price Indicators reflect the company’s judgment of the price at which spot and near-term transactions for significant quantities of natural uranium concentrates could be concluded, based on data from recently completed and/or pending transactions, and firm bids to buy and firm offers to sell uranium concentrates on the spot uranium market. Denver, CO, May 29, 2013 -- Nuclear industry participants gathered in Beijing, China, for the 9th Annual China Nuclear Energy Congress (CNEC) on May 15-16, which focused on China's nuclear power industry and culminated with a panel discussion moderated by TradeTech Business Development Director Bahi Sivalingam, which provided insight into supply and demand concerns in today's global uranium market. The panel discussed challenges of bringing new uranium mining projects into production, including the effects of today’s uranium market on exploration and development activities. Panelists included CNEC speakers Zhou Zhenxing, chairman of China General Nuclear Power Group and Chen Yuehi, vice general manager and vice director of China Uranium Corporation and China National Nuclear Corporation’s Department of Geology & Mining, as well as James Dobchuk, president of Cameco Inc., who all agreed that market price may play a pivotal role in the future uranium supply industry. Sivalingam presented TradeTech’s “Call on Mine Production” forecast, which estimates that 210 million pounds U3O8 will be needed by 2025 to fill a supply gap. Dobchuk expressed the view that the current uranium price does not support production that is needed for future uranium supply, and as such, some projects may be delayed or remain undeveloped. Chen agreed and highlighted the importance of an efficient market price to support uranium end users and a balanced uranium production environment. Meanwhile, Zhou said that today’s market price is not a significant concern as he believes it is sufficient for new development. However, he also expects a market correction if one is needed to stimulate new production in the future. Sivalingam asked panelists about new project financing concerns, which may create challenges in the uranium supply sector. Dobchuk said that today’s market can make it difficult for some uranium developers to secure financing, especially junior companies. In contrast, both Chinese participants said that the current market would not inhibit financing of new uranium projects for China, domestically or abroad. TradeTech, and its predecessor companies–NUEXCO Information Services, CONCORD Information Services, and CONCORD Trading Company–has supported the uranium and nuclear fuel cycle industry for more than 40 years, and is widely recognized for its expertise in trading activities and its comprehensive knowledge of the technical, economic, and political factors affecting this industry. TradeTech provides expert market consulting, participates in the buying and selling of uranium products and services, and maintains an extensive information database on these industries. TradeTech publishes the Nuclear Market Review (NMR) each Friday evening, which reports the weekly uranium spot market price, uranium trading activity, industry news, and market data. The monthly edition of the NMR, published on the last day of each month, includes TradeTech Market Values (NUEXCO Exchange Value®, UF6 Value, Loan Rate, Conversion Value, SWU Value, and Transaction Value) and Mid- and Long-Term Price Indicators, as well as analysis related to these price determinations, supply/demand information, and industry news. TradeTech also publishes The Nuclear Review, a monthly trade publication dedicated to the international uranium and nuclear energy industry. Denver, CO, Jan 5, 2012 -- The year 2011 was a tumultuous period as uncertainty clouded the uranium market and TradeTech’s U3O8 Spot Price Indicator (Bloomberg: TDTC) ended the year at US$52.00 per pound U3O8, amid record spot volume as the market continued to stabilize following the crisis at a Japanese nuclear power facility in March. Early in the year the uranium market showed signs of stability as the spot price followed a strengthening trend that began in 2010, when the market was recovering from a global financial crisis that began in late 2008. TradeTech’s Weekly U3O8 Spot Price Indicator had climbed to US$73.00 per pound U3O8 on February 4. However, the spot price settled at $67.75 on March 11, when Japan’s Fukushima nuclear station was severely damaged by a devastating earthquake and tsunami. As the crisis continued to unfold, buyers and sellers considered potential short- and long-term impacts of the events in Japan while the uranium market tried to regain stability. On August 26, the spot price fell to the lowest point of the year—$48.85—before rebounding to $56.25 by mid November, when traders became more active and purchased the majority of material sold that month. As 2011 came to a close, spot market demand remained primarily discretionary and TradeTech’s U3O8 Spot Price Indicator was $52.00 per pound U3O8, the company noted in its December 31 Nuclear Market Review. Despite price volatility affecting the spot uranium market throughout much of 2011, higher spot volume prevailed to set a new record of 45.8 million pounds U3O8, surpassing spot transaction volume of 42.8 million pounds U3O8 in 2010, the highest level recorded in two decades. “Fourth quarter sales of more than 9 million pounds brought 2011 spot market volume to a new record level, as traders, uranium producers, and financial entities attempted to place material before year end,” TradeTech President Treva E. Klingbiel said.